Leading waste management companies, technology developers and research organisations have teamed up with four European cities to demonstrate innovative solutions to transform urban biowaste into high value-­added products, helping cities to increase their recycling rate and creating new circular economy business opportunities. These activities will be carried out during a four‐year project–SCALIBUR (Scalable Technologies for Bio-­Urban Waste Recovery) coordinated by the Packaging, Transport and Logistics Research Center-­ITENE and funded by the European Union’s Horizon 2020 programme. 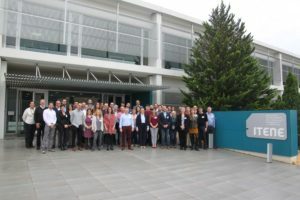 Representatives from the 21 institutions taking part in this initiative held a kick‐off meeting on 14‐15 November in Valencia (Spain). In the EU over 100 million tonnes of biowaste are thrown away each year–around 200 kg per person. Currently 75% of this goes to landfill or is incinerated, causing major environmental problems: biowaste produces greenhouse gases when it decomposes and contaminates soil and groundwater. Landfilling of biowaste goes against the principle of a circular economy and is a waste of nutrients, energy and resources for bioproducts. • Commodity chemicals, bioplastics and biopesticides from household waste. Biowaste will be biochemically converted by an innovative enzymatic hydrolysis treatment at Spain’s National Renewable Energy Centre (CENER), using optimised enzymatic cocktails from ASA, a German biotech company. The resulting liquid hydrolysate will be upgraded by fermentation into biodegradable polyesters by Novamont, and also further tested by CENER to produce biopesticides. The solid hydrolysate will be further processed by Spanish engineering company AERIS, who will use solid state fermentation to produce biopesticides. • Proteins, lipids and chitin from HORECA and retail waste. Insects like black soldier fly can very efficiently convert kitchen and restaurant scraps into a rich biomass. Italian company Kour Energy and the University of Modena and Reggio Emilia will rear black soldier flies to produce proteins, lipids and chitin, which ITENE will use for the production of reinforcement bioplastic for food packaging. The protein will be validated for food and feed applications by Nutrition Sciences and Zedatec. • Bioplastics from urban sewage sludge. SCALIBUR will demonstrate two prototypes for the anaerobic bioconversion of sewage sludge to produce three fractions: a nutrient enriched liquid for fertigation, a solid for biofertiliser production, and biogas to obtain high­‐value compounds. Via an innovative start­‐to­‐end valorisation process developed by water management company Aqualia, the biogas will be upgraded into high value chemicals for industrial purposes. In parallel, a pilot involving WETSUS (European centre of excellence for sustainable water technology), and water board Waterschap Brabantse Delta, will valorise surplus sewage sludge into polyhydroxyalkalnoates (PHA) biopolymers to be used in packaging production by ITENE. The sustainability of the developed products and processes will be evaluated by CENER, ITENE and Exergy. SCALIBUR aims to inspire a revolution in urban biowaste recycling in Europe. Greenovate! Europe will lead activities to facilitate the replication of the project’s solutions, including an e­‐learning training programme for municipalities and entrepreneurs. Municipalities looking to improve biowaste recycling in their city are invited to join an Early Adopter Club, which will organise activities to share best practices from the SCALIBUR pilots. Recycling of biowaste into bio­‐based products creates many new business opportunities. Greenovate! Europe will mentor 10 entrepreneurs and bus inesses looking to enter this market. All information will be available via an online Stakeholder Platform, developed by IRIS. You can follow the progress of SCALIBUR on Twitter@SCALIBUR_H2020 and on LinkedIn SCALIBUR Project. The project website and stakeholder platform will be live in 2019. The SCALIBUR project has received funding of €10 million from the European Union’s Horizon 2020 research and innovation programme under grant agreement nº 817788.